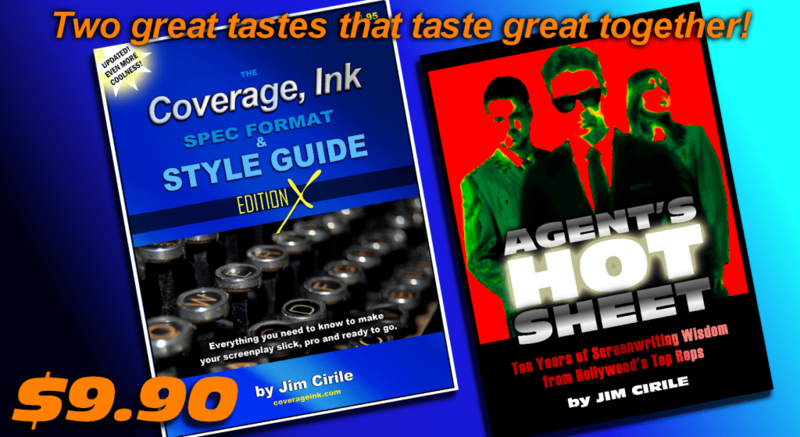 Two Essential E-Books from CI Founder Jim Cirile — Agent’s Hot Sheet and The CI Spec Format & Style Guide. Most of us know the basic components of a script and how to line things up on the page. Heck, screenwriting software eliminates all the guesswork, right? Yeah, sort of. But it doesn’t help you with things like panache or guide you towards a snappy, visual presentation; nor does it tell you what the industry is expecting — what’s in style and what most definitely is not. Well, fear not! Newly revised and massively expanded for 2019, The CI Spec Format & Style Guide Edition X will help you master screenplay format — and is chock full of tips and tricks to help even pro writers get shredded and amp up their voice. 126 pages jam-packed with examples and fun, the Guide is both comprehensive and brutally single-minded — you will be writing visually, down the page, showing, not telling, and using verbiage that lands like an uppercut to the jaw. Geared for everyone from beginners to professionals, our CI Spec Format and Style Guide will help you bring it. Check out an excerpt right here. Written by CI founder Jim Cirile, the Guide takes you through the ins and outs of screenplay format, from taking those first baby steps through pro techniques. Even seasoned writers will glean a ton from the Guide’s abundant editing tricks. Included is our very own Coverage, Ink. Magic Movie Formula and the CI Magic 1-Hour TV Pilot Formula. These handy little cheat sheets lay out when and where every major plot event should happen according to myth (features) and per act (TV). Even if you hate formula, knowing the rudiments is crucial. We guarantee you’ll find the CI Spec Format & Style Guide Edition X invaluable, no matter what level you’re at! 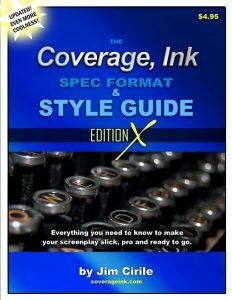 The CI Spec Format & Style Guide Edition X: everything you need to make your screenplay slick, pro, and ready to go. To order the Guide with your Coverage, Ink script analysis, just click the Submit It! tab whenever you’re ready to submit your script. You’ll be able to add it on your order form. To order the Guide without submitting a script right now, click the buy now button. For 10 years, Coverage Ink’s Jim Cirile wrote the Agent’s Hot Sheet column for Creative Screenwriting magazine. One of the magazine’s most popular features, every issue featured an all-star panel of the top literary reps in Hollywood discussing what to write, strategies for breaking in and sustaining a career in TV or features, maximizing the effectiveness of your writing craft, how to get their attention, and much more. Also includes detailed case studies of specs that sold and how they did it and of course, detailed analyses of what’s hot — and what’s not. Richard Arlook (Gersh Agency/Arlook Group), Nicole Clemens (ICM), Emile Gladstone (ICM), A.B. Fischer (Schuman Co.), Jennie Frisbie (Magnet Management), Mike Goldberg (New Wave Entertainment), Ava Jamshidi (ICM/Industry Entertainment), Julien Thuan (U.T.A. ), Jake Wagner (Good Fear/Benderspink)… And many more. – Seriously, How Do I Get a &[email protected]*^@! Agent? … And over 50 more! 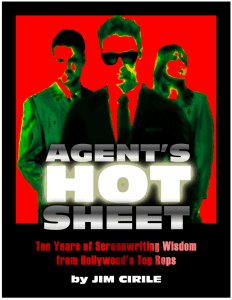 To order the Agent’s Hot Sheet e-book with your script analysis, just click the Submit It! whenever you’re ready to submit your script. To order Agent’s Hot Sheet as a PDF e-book without submitting a script right now, click the buy now button below. Or buy both the CI Spec Format & Style Guide Edition X and Agent’s Hot Sheet and get off — ONLY $9.90!